People who work in hospitals, particularly physicians, physician assistants, nurse practitioners and residents are throwbacks who still use old-fashioned paging technology. My colleague, the Skeptical Scalpel, recently lamented this fact in one of his blog posts. But they do seem to be a necessary evil, since cellular coverage is often limited deep inside of buildings. But how much to trauma professionals get paged? An oral presentation at the recent Congress of Neurological Surgeons described a study that monitored paging practices between nurses and neurosurgical residents. 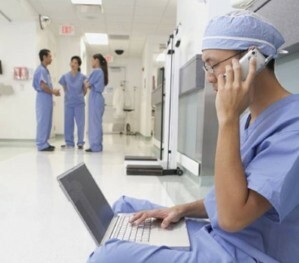 Medical students were paid to follow neurosurgical residents during 8 12-hour call shifts. They recorded the paging number and location, priority, and what the resident was doing when paged. Bottom line: Yes, we are throwbacks using an old technology. But it does serve us well. Unfortunately, it’s an old technology being used in an inefficient manner. I recommend that nursing units make it a practice to maintain a “page list” of nonurgent items. The trauma professional can then stop by or call each unit periodically (every 2 hours or some other appropriate time interval) and deal with all of them at once. Obviously, urgent and emergent problems should still be called immediately. This will ensure that routine issues are taken care of in a timely manner and the trauma pro can attend to their other duties as efficiently as possible. Reference: Oral Paper 113: An Observational Study of Hospital Paging Practices and Workflow Interruption Among On-call Junior Neurosurgery Residents. Presented at the Congress of Neurological Surgeons 2012.